I didn’t want this to turn into “yet another cooking/recipe blog”… but when I get enough requests for recipes, I’m going to put them here, rather than Facebook. So I present: my very own grain free crust recipe. Adapted from a variety of sources, and adjusted and tweaked every time I tried it until it was perfect. Well, as perfect as it gets without grains! Mix together ingredients until “dough” starts to come together. It may help to knead it somewhat with your hands to make sure everything is incoporated very well. Press dough into a pie pan, using the palm of your hand to reach desired thickness. (Saran wrap or a thick plastic bag may help keep the dough from sticking to your hand.) You could probably use a rolling pin to make the crust flat, but I haven’t tried that yet. Poke crust with a fork to avoid bubbles. Bake crust about 15 – 20 minutes, or until lightly golden brown. 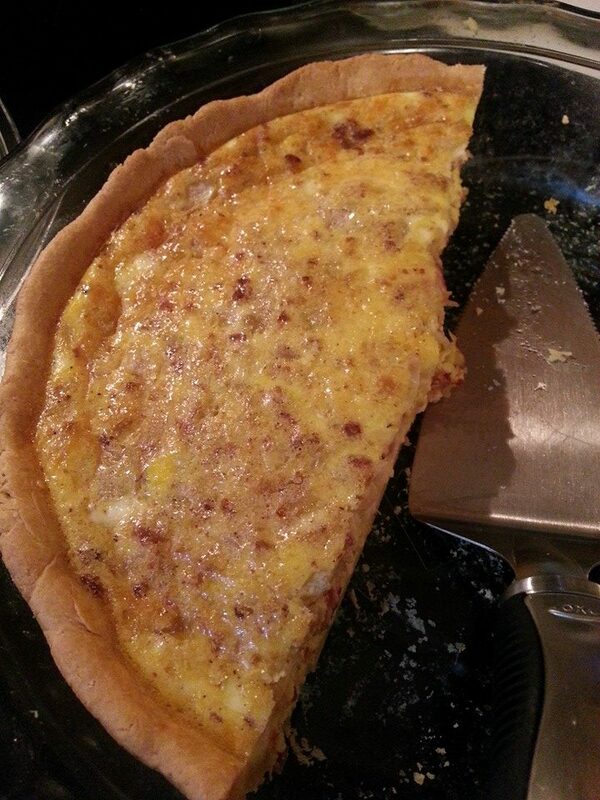 Quiche featuring my grain-free crust! Categories: Cooking | Tags: grain-free | Permalink.